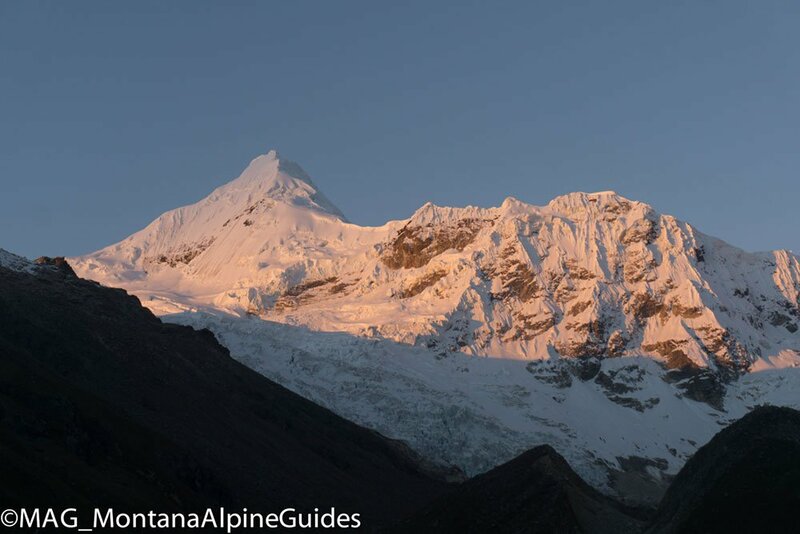 The Ishinca Valley is home to four prominent high-altitude peaks; Urus, Ishinca, Tocllaraju, & Ranrapalca. 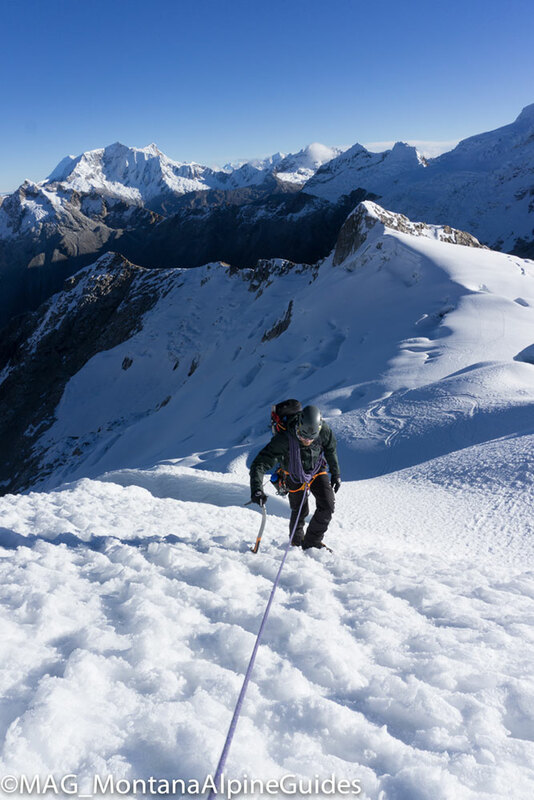 Any single one of these summits makes for a worthy expedition, but climbing three peaks,makes for an incredible trip, and that is our teams objective. 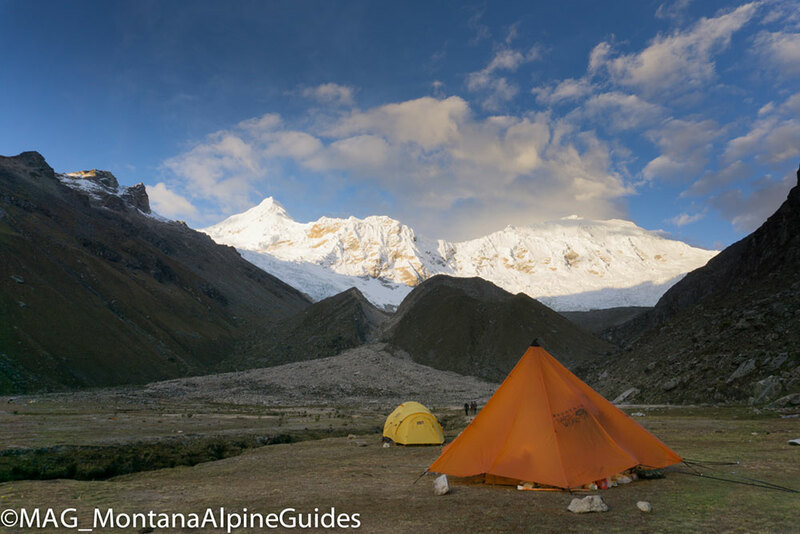 Our base camp is positioned in a beautiful high alpine meadow at the head of the Ishinca Valley dotted with glacial erratic granite boulders, and high peaks towering over head. 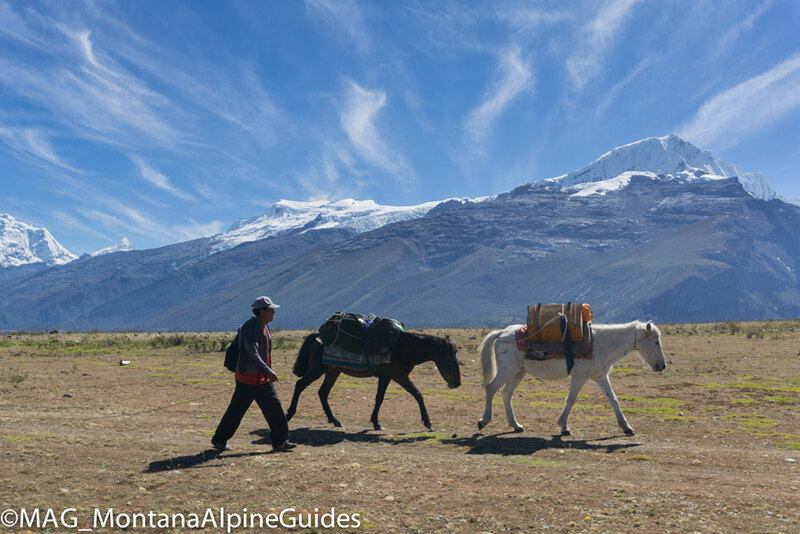 We have donkeys to carry our loads for the hike in as we further acclimatize with light daypacks. 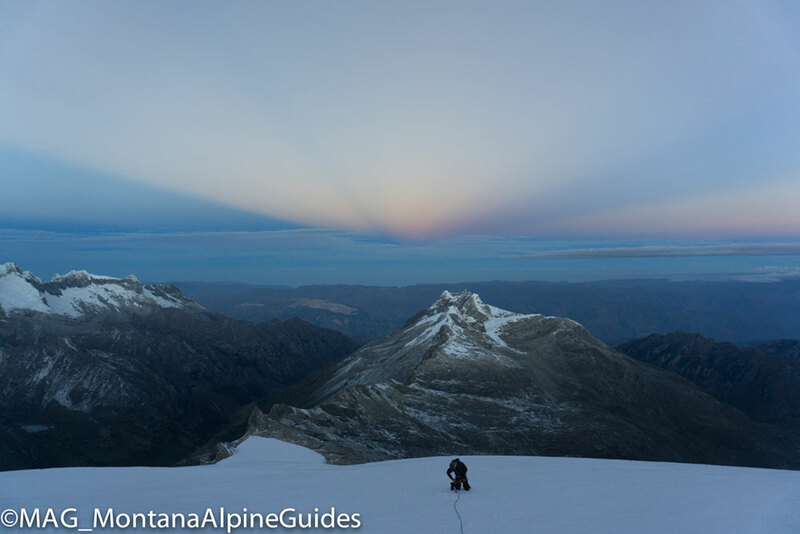 Our cook at camp prepares all meals allowing us ample time to focus on our climbs, relaxing, and acclimatizing. Urus: We wake up and ascend the slopes of Urus by headlamp arriving at the glacier by day break. 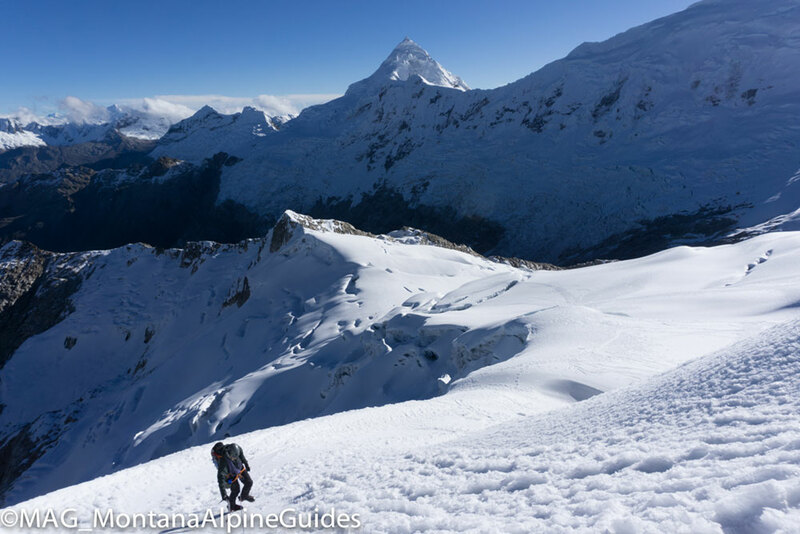 This climb helps to further our acclimatization and offers commanding views for our next objectives on Ishinca and Tocllaraju. 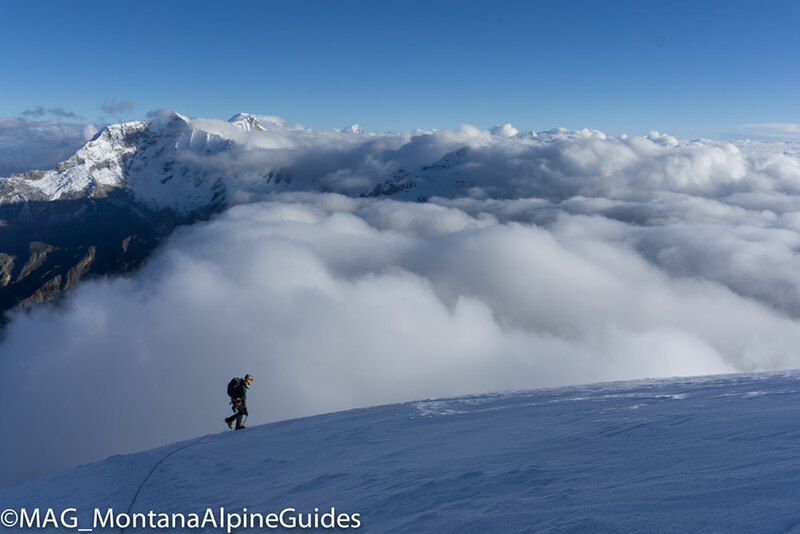 The snow slopes rarely get steeper than 30 degrees on this ascent. 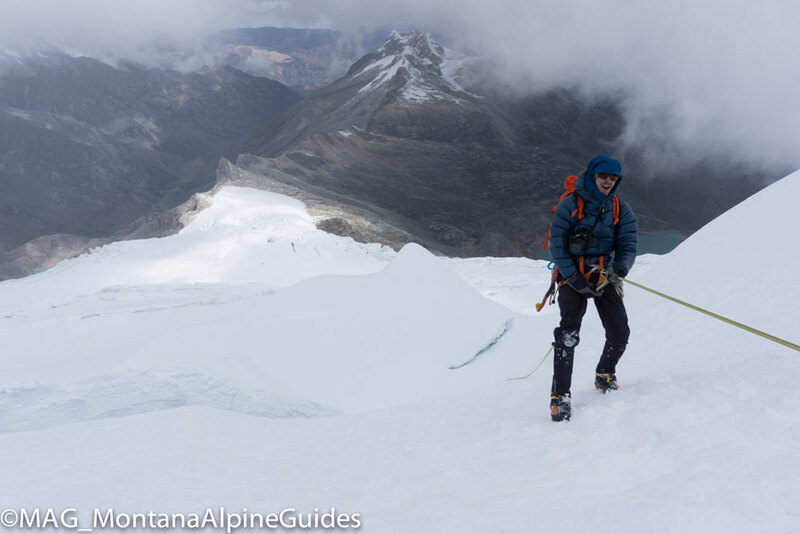 We will review glacier travel skills and or introduce skills to party members refining the skills and travel techniques for our rope team on Ishinca and Tocllaraju. 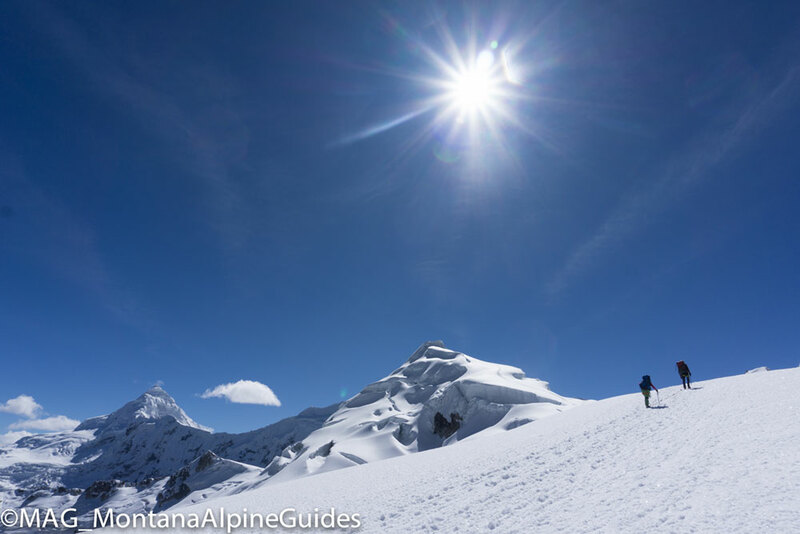 Tocllaraju: Tocllaraju mandates moving up to a high camp to make for a shorter summit day. 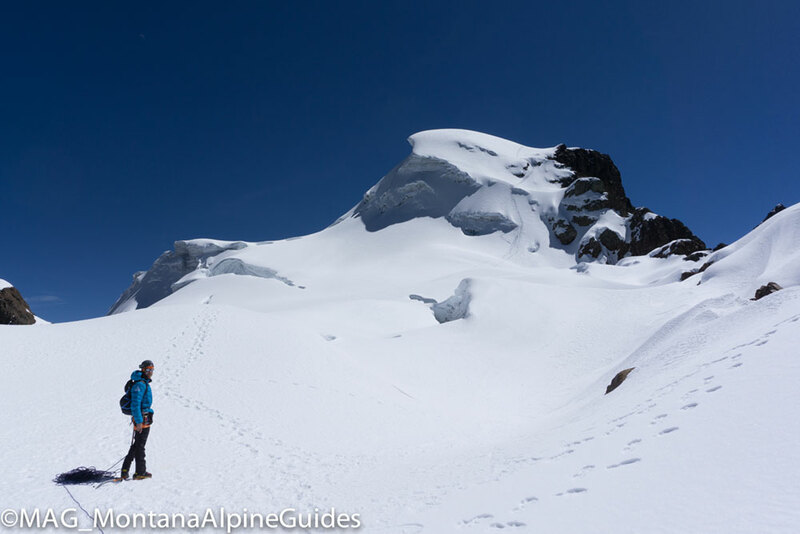 We spend a day ascending from basecamp to Tocllaraju’s Moraine at ~17,500’. We settle into the terraced rock platforms for the afternoon prepping our early morning start. Again we begin climbing at dark via the west ridge to then gain the south face. 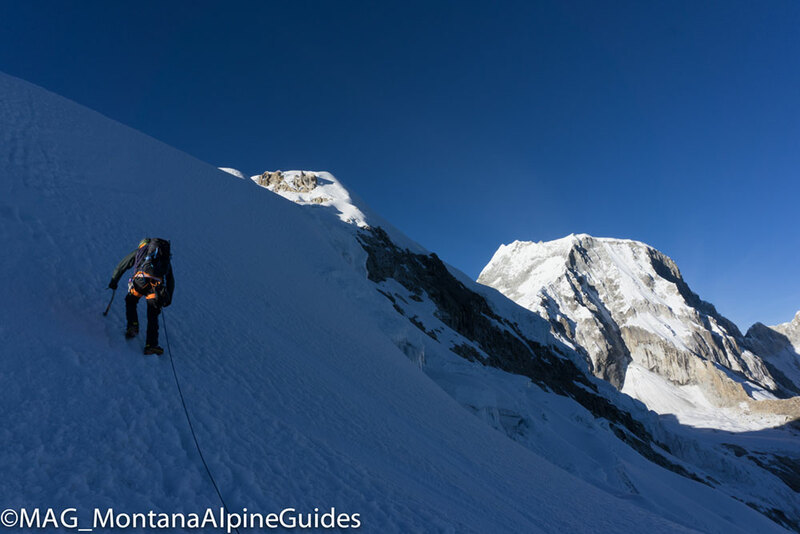 This objective is steeper, higher, and longer than our previous climbs, but at this point we are well acclimatized. 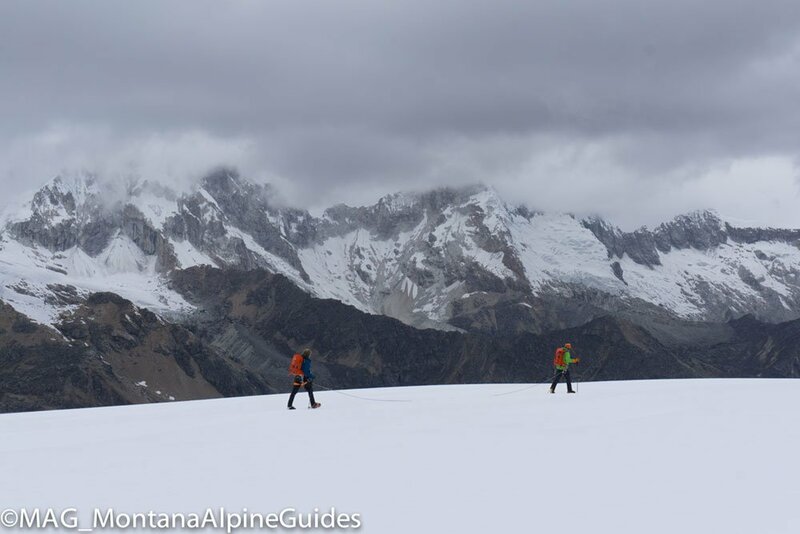 We then descend back to camp, optionally bumping back down to basecamp. 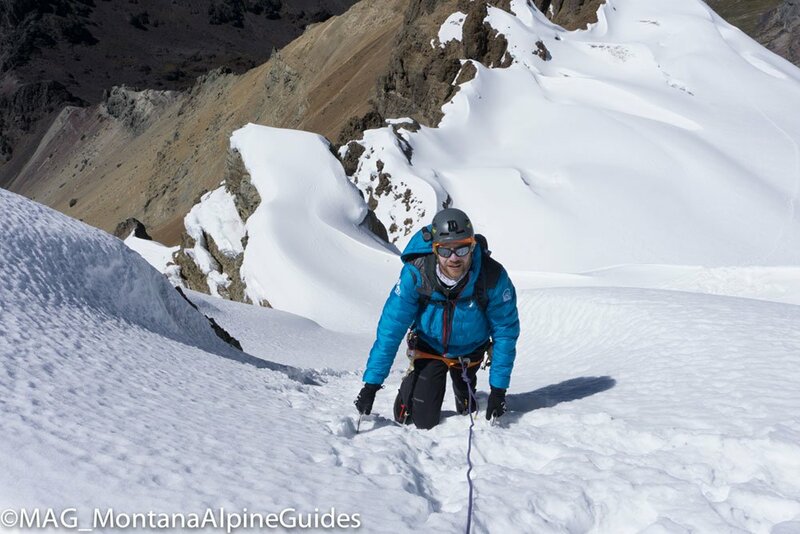 Prerequisites: This expedition is for climbers with glacier travel technique skills and experience traveling on glaciers as a rope team. 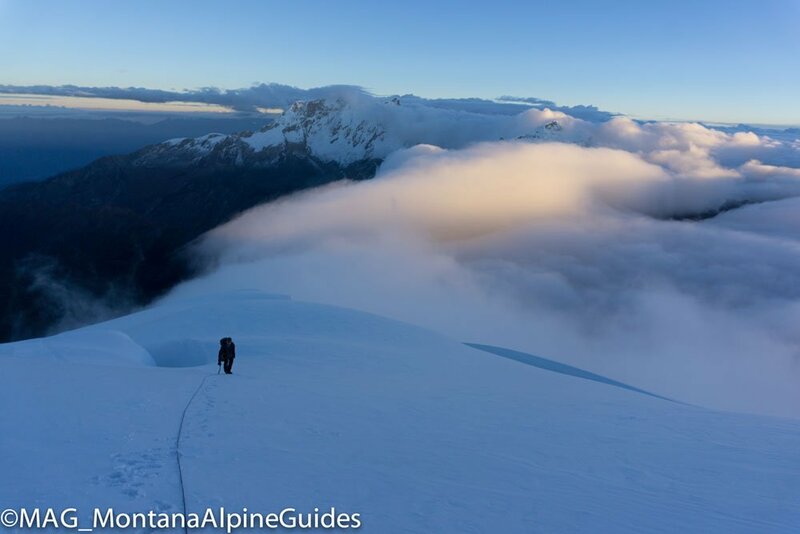 The objectives are for those looking to get into high altitude mountaineering in one of the worlds most accessible and beautiful mountain ranges. 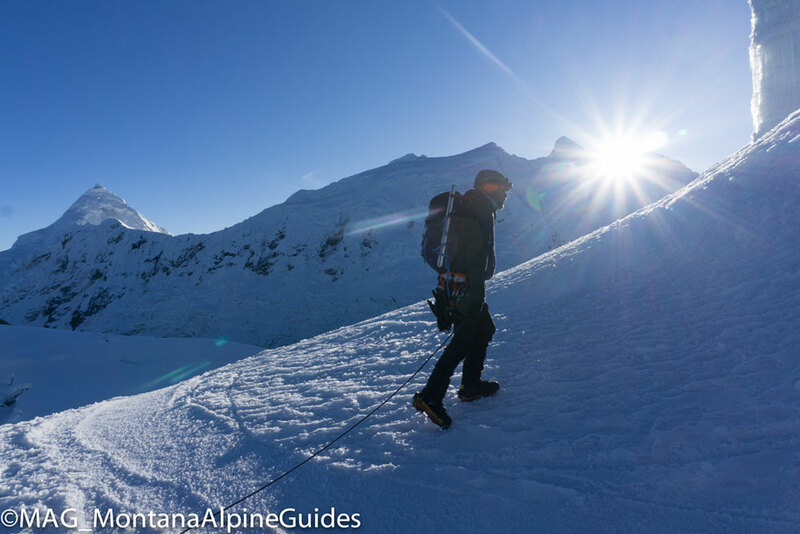 We offer training seminars for those without glacier travel experience. Travel: Flights should be arranged to arrive the evening on Day 1 from our itinerary. Flights home should be scheduled for 10:00 pm or later on the last day of our itinerary or for the following morning. Travel insurance is highly recommended. MAG will arrange and cover your private airport pickup and transfers to the bus station on the front end of your trip. If you decide to stay overnight on the tail end of your trip you will need to cover that expense. Pick up from the Lima airport and drop off at the airport at the end of the trip. 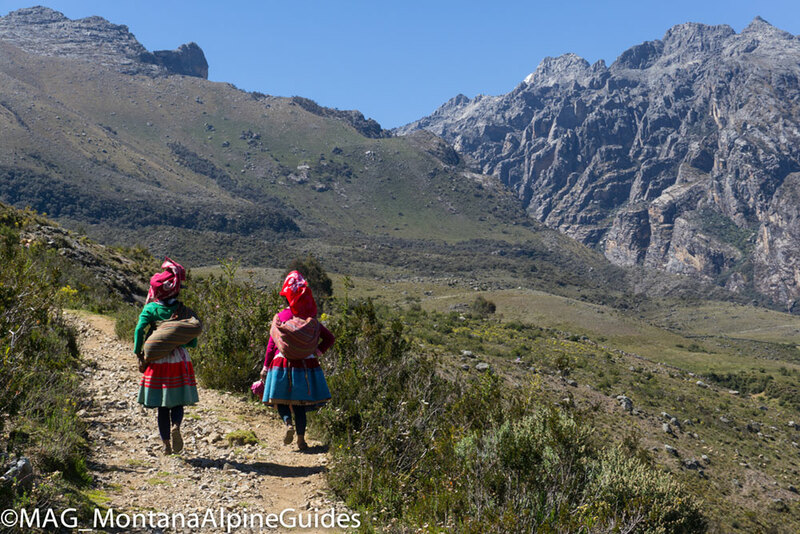 Day 3: Orientation meeting in hotel, 4-hour acclimatization hike to the Puka Ventana, return to Huaraz hotel. Day 4: Day hike to Laguna Churup 4450m (14,600’), approximately 5 hours of hiking round trip. Return to Huaraz, night in hotel. Prices based on a minimum of 4 participants.